The train’s clattering out of the station with a bit of a wheeze. She may run on electricity – but she whines a lot. I’ve just been told, by a new British citizen, that this is the oldest electric railway in the country. I don’t know if it’s true, but in deference to his newly British status I’ll trust him. The level crossing gates lift with that, ‘Ohhhh-kaaay, here we go’ noise and, with a handful of other around-at-midday people, I toddle across the tracks. I feel as if I’m in a painting, brought to life. A scene from the late 1950s or maybe the ‘60s. Surrounded by shoppers out walking, trussed up in winter coats and wearing gloves and hats. There’s even a basket or two. It’s odd, this harmonious blending of time and place. Is it because I’ve just been to a ceremony in a bit of old – but definitely not twee – England? Is it because for once I’m conscious of my luck, my pleasure, in being here? There are more glamorous places than Bootle, a community ripped to pieces in World War II, but it has a cracking Town Hall. And that’s the location my in-house American, now also British, has chosen for his ceremony. Bootle Town Hall was built in the 1860s, when English towns were first allowed to be ‘incorporated,’ to become corporations and raise money by collecting local rates or borrowing. It’s quite a fine building, imposing, solid – sure of itself. The industrial north is studded with such edifices, monuments in stone to their civic pride and industrial prowess. She shows her age, inside, the old place. Each decade has left its mark, except perhaps the last. But she’s a character. The wrinkles tell of joy and sorrow and pain and pleasure – politics and community. Botox she does not need. She’s a survivor and she shows it. For Bootle and neighbouring Liverpool their livelihood was the sea, the docks a vital lifeline for the nation. And, therefore, prime German targets when the war came. But, that the Town Hall survived the bombing of World War II is not just down to luck or character. Its proud, ‘look-at-me’ sandstone walls had to be obscured by painting them with pitch, because German aircraft were using it as a landmark for their bombing raids. 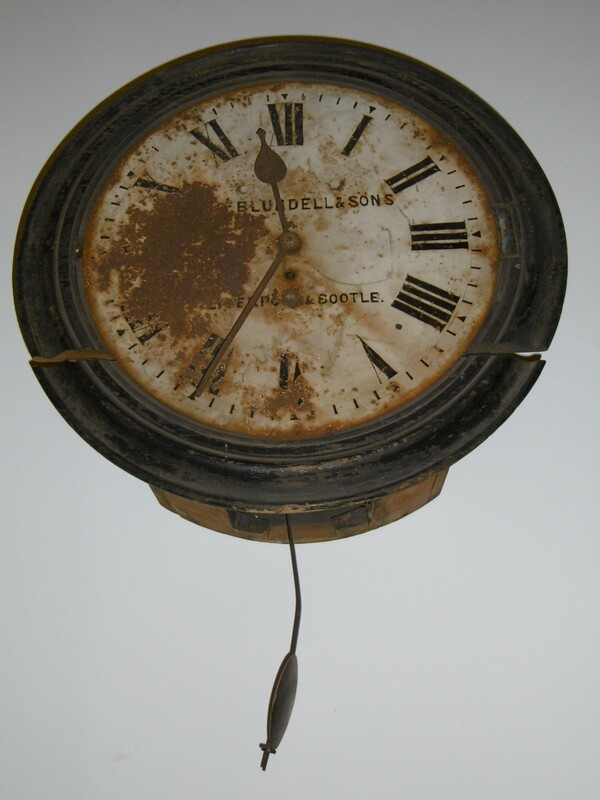 A clock hangs on the wall, forever stopped at 11.34, the hour the bomb hit the infants’ school in May 1941. Three-quarters of Bootle’s housing was bombed in one week. The war saw 1886 civilians dead and injured, more deaths, proportionately, than any other township in the UK. All because Bootle’s docks were critical to winning World War II, in the Battle of the Atlantic. Worn, tattered flags now hang below the ceiling in the council chamber, presented by ships’ captains docked in Bootle between U-Boat stalking missions. The most celebrated is the ‘General Chase’, flown for only the third time in British naval history by one Captain ‘Johnny’ Walker, hounding down German subs in the Bay of Biscay. The first occasion was by Nelson in the Battle of the Nile, the second, by Sturdee in the Battle of the Falkland Islands in 1914. Walker died not long before the war ended. Worn out, according to the friendly, affable Lord Mayor of Sefton, with whom we’re chatting. A charming man with a trim white beard, the Mayor has already handed over the new Brits’ certificates and gifts – silver-plated picture frames. He’s posed for photos with Chinese, Thai, New Zealand and American folks who made the grade, became British today. It was moving, you know. Mine weren’t the only eyes that were moist. They played God Save the Queen and for once, instead of that inner grumble, ‘why do we have such a boring national anthem?’, I felt a surge of pride, in the nation and the people who’ve paid so much in monetary and possibly – who knows? – other terms, to join us. To become British. The Mayor’s being chivvied to attend to his next engagement, but first he stops to ask us if we recognise the symbol at the centre of his mayoral chain. I don’t. We don’t. After ten years living in Sefton Council territory, seeing the symbol on letterheads and signs, we’re clueless. To be fair, Sefton was only created in 1974, hacked out of old Lancashire. So no-one really loves it, is loyal to it. It has little or no real meaning. But it has a symbol. A design based on a water mill. And the French for ‘water mill’ is the origin of the local Molyneux family’s name. The Molyneux family that came over with William the Conqueror in 1066. Now isn’t that an irony? On the day my husband becomes a proper immigrant, a citizen, along with people of three other nationalities, we learn our local council’s visual identity is based on the name of a foreign invader. An invader who became the power in the land. It’s a nice reminder, as the next election picks up steam, as our political parties bite the prejudice bullet and talk about immigration. We Brits are a very mongrel lot. But we’re all humans. Many languages, many religions. Many colours, shapes and sizes. Just one race, though, not many. And we all originate from … Africa. This entry was posted in Art, jaunts & going out, Britain now & then, Lancashire & the golf coast, Liverpool and tagged Battle of the Atlantic, Bootle, British Citizenship, Captain Johnny Walker, Liverpool, Sefton, The General Chase, trains, U-Boats, World War II. Bookmark the permalink. Congratulations to your husband on becoming a British citizen! Your story so beautifully reminds me that WWII was fought so that everyone would have the right to live peaceably wherever in the world they desired. Thank you! 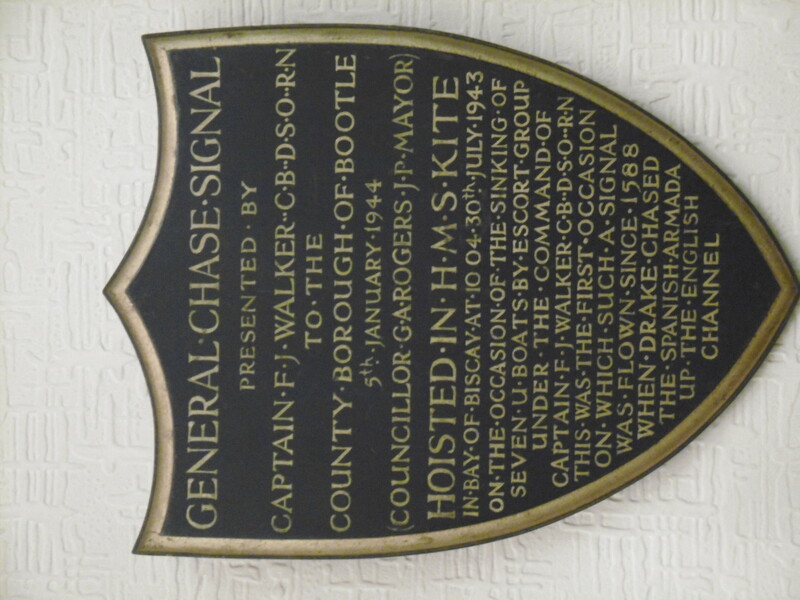 Bootle was my favourite place for a day – it’s so sad that it was so heroic and suffered so during the war – the mess that has been made of it since feels like a real betrayal of trust. I cannot imagine how difficult it must have been to attempt to rebuild the devastation so much of UK went through after the war. It has taken a very long time and some of what was done with the best of modernist intentions has made matter worse not better. There is still evidence around after all this time, as well,some deliberately left like the beautiful ‘bombed out church’ in Liverpool city centre whiihc is used for art instlaations and open air (the roof being gone) cienema now and again – but some not. Outside the underground HQ of the Battle of the Atlantic Western Approaches in Liverpool (itself very poignant) across the road is still the remains of some bomb damage. Being a bred (of many generations) & born Australian citizen, I wonder if it’s a head or heart or -likely- combination of both that makes a person take up citizenship of a new country. I guess it doesn’t change their history or who they are, simply aspects of their future. But I do understand a feeling of belonging, if that’s any part of it. Sort of like the difference between defacto and legal marriage, which has made absolutely no difference to our day-to-day life but feels nice. Immigration, multiculturalism, invasion… all hot topics in Australia too. Many of our ancestors came here in boats… some a long time ago, some immigrants recently not just in boats but planes – the only options given our island geography. Even the indigenous peoples before that… as you say… Africa. Makes it hard for us who, apparently selfishly, want to celebrate Australia day. I say there’s room for everyone, it’s inevitable one way or another as your Molyneux historical anecdote suggests. And in the end we simply literally muddle together. Why fight about it now. You hit the nail right on the head as usual. Like marriage, it makes no difference but makes a difference. He said much the same thing later that day, he does feel different and it is a kind of belonging – a legitimacy too I think. He made the decision with both head and heart – he wanted to vote which is the heart bit I think – although he has always loved this country. The head bit said, no taxation without representation like thsoe pesky rebels across the Atlantic – he’s both an American and a Brit now, after all! The world is just a great big onion, as the song goes, but it should be a chocca mocca chai latte. Or something like that. But while politicans and others encourage division for dubious motives there is no hope. I read an arrticle about Montgomery, Alabama. Martin Luther King’s church and the whole slaving past of the town is barely visible but white folks parade arpound singing Dixie. We have a long, long way to go till we’re all, male and female, all skin tones, free at last. Very moving Mary. Congratulations (and welcome) to Larry! So moving story! Thank you for sharing it here! Thanks, Olive, glad you enjoyed it.